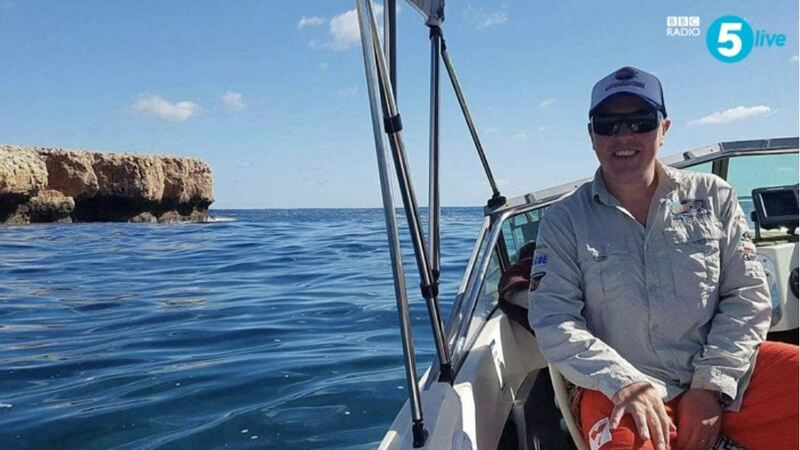 5 Miles With A Tiger Shark: The Story Of John Craig - We Love Sharks! 5 Miles With A Tiger Shark: The Story Of John Craig - We Love Sharks! British diver John Craig found himself swimming for 5 miles with a Tiger Shark. Here is his story. John Craig, an experienced diver and diving instructor, was spearfishing in Australian waters when he had a once in a lifetime encounter with a Tiger shark. Despite his terror and fear, the chance meeting with the shark didn’t turn out as he expected. Read his incredible story below. John Craig is a very experienced, 34-year old British diver originally from Sunderland. But he moved to Australia about 2 years ago. He went out in a boat with a friend for a spearfishing trip near Shark Bay off the coast of Western Australia last month (October 2017). Unfortunately, during the course of the trip, he lost sight of the boat while he was in the water. The boat was also having engine problems while battling with strong currents. As a result, the boat drifted away. He explained his feeling of panic in an interview with the BBC at being left alone out in open water. “I was trying to splash and scream and shout to get my friend’s attention. All of the splashing, I could feel my heart rate up because I was panicking that I had been left” he said. After almost 10 minutes of yelling and splashing about, he put his head in the water to check that he was still swimming in the same spot when he made a stunning realization. Just about an arm’s length distance from him there was a huge 4-meter long shape; a tiger shark. He said “I just kept my head in the water, watched what the big tiger shark was doing.” The shark kept darting away and coming back towards him. Every time it came close he would point his spear gun at it to kind of fend it off and try as much as possible and keep the animal away at a safe distance. Eventually, he decided that the boat wasn’t coming back for him so he had only one choice; swim for shore. After deciding that the boat wasn’t coming to rescue him, John Craig began swimming for the beach. A distance of about 4.7 miles (7.5 km) but of course that was quite an ordeal with a tiger shark circling him. As he made for shore, the shark kept pace behind him. It’s huge head remained just a few inches away from his feet. It would occasionally disappear into the gloom only to suddenly reappear below or beside him. The shark kept pace with him swimming in what could be described as almost protectively, steering him back to shore. This continued till the diver was spotted and rescued by a boat belonging to the Shark Bay Volunteer Marine Rescue. You can listen to the audio version of John Craig’s interview by clicking this link. John Craig later said in retrospect that his initial panicking and elevated heart rate attracted the shark and kept it coming back. What Can We Learn From The Story Of John Craig And The Tiger Shark? Although this hair-raising experience sounds like a nightmare to most people, Craig later said that he sees that humans are not actually on the menu of sharks per se. His reflection now is on how beautiful and graceful the shark, a female, actually was. He is also concerned about the fact that these creatures are important in the marine ecosystem. Whatever the case, it’s easy to understand his initial panic. After all, tiger sharks are listed second only to Great Whites in recorded attacks on humans in the International Shark Attack File at the Florida Museum of Natural History. These sharks are known to approach humans out curiosity but have exhibited aggression that unfortunately led to a few fatalities. However, it’s obvious his yelling, trashing, and elevated heartbeat attracted the shark in the first place. Probably even from miles away. In fact, tiger sharks in particular are very sensitive to vibrations in the water. They can easily detect the heartbeat of creatures around them. And even though the flu is 60,000 times more likely to kill you than a shark bite, the general impression of a “monster” won’t go away. No thanks to the determination of collective human ignorance and the media to continue painting sharks as blood-thirsty man-eatears. Unfortunately, the damage is somewhat already done and it may be difficult if not almost impossible to remove the monster title sharks have earned. Today, sharks are still regarded as the scariest beats in the water, although humans are killing millions of them every year! John Craig swam almost 5 miles with a tiger shark and he came away not with severed limbs but with a new sense of respect and awe. Was it a case of luck, fate, or just a friendly shark? You be the judge.